Shah Rukh Khan just made our morning happy by posting this super cute video of little AbRam dancing for his siblings Aryan and Suhana. AbRam, 5, wished Children's Day to Aryan and Suhana in the most adorable way possible and SRK made sure to capture it. 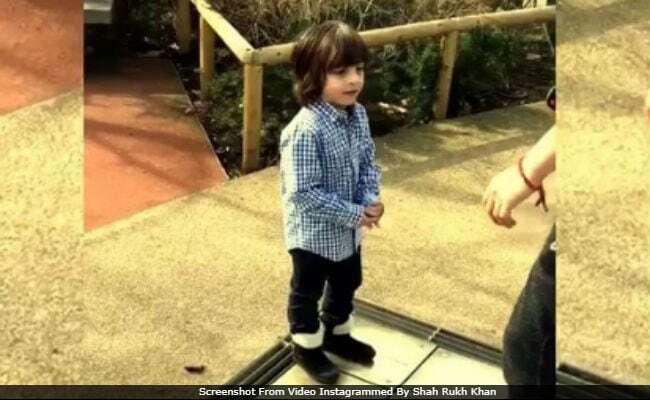 In the video shared by SRK, AbRam, dressed in black denim and a blue checked shirt, dances happily to an instrumental beat. (Aww). "A madly happily childly dance for Aryan & Suhana by lil AbRam on this day of kids," wrote SRK while sharing the video. Shah Rukh Khan and Gauri have been married since 1992. They are parents to three children - sons Aryan, AbRam and daughter Suhana. Aryan studies films in California while Suhana is finishing school. Here's the video. (Please don't forget to thank SRK, we already did). Meanwhile, Shah Rukh Khan also celebrated Children's Day with special kids. "Reliving my childhood this #ChildrensDay ! The babies taught me a step or two," he wrote. Here's how SRK spent his day. Shah Rukh Khan turned 52 on November 2 and celebrated his special day at his Alibaug farmhouse. Celebs like Alia Bhatt, Katrina Kaif, Deepika Padukone, Sidharth Malhotra, Malaika Arora, Karan Johar, Sussanne Khan, Shweta Bachchan Nanda and many others, reached Alibaug to be a part of the lavish party hosted by SRK and Gauri. Inside SRK's Alibaug bash. (Suhana and her gang stole the thunder yet again). Last seen in Jab Harry Met Sejal, Shah Rukh Khan is currently shooting for Aanand L Rai's untitled film with Katrina Kaif and Anushka Sharma, his Jab Tak Hai Jaan co-stars.